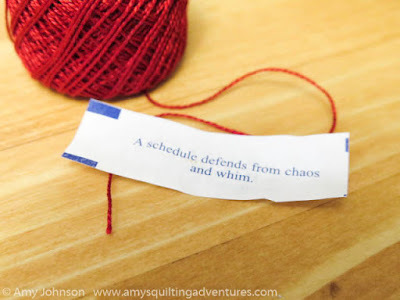 I've been working on creative a better routine or schedule to help me accomodate my increased blog posting, Craftsy class duties, taking care of my wonderful customers at www.amysquiltingadventures.com, and still getting actual quilting done. I nearly dropped my chopsticks laughing! I'm not one to take a fortune seriously, but I can extra encouragement wherever I find it! But just remember...Whim is often necessary. LOL! I forgot to include that my first response when I opened that cookie was, "But I like whimsy!"